Why is the Outdoor Classroom so special? 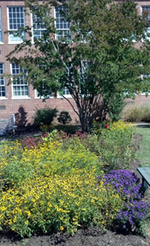 The Sligo Creek Elementary School and Silver Spring International Middle School Outdoor Classroom is a large, enclosed courtyard where students from both schools learn about their environment in a natural setting. Students have experiences with growing edible gardens, planting and harvesting food, observing the interactions between plants and animals, recording the beauty of nature in photographs and drawings, and more. Many lessons are aligned with MCPS Curriculum 2.0, and we are working to incorporate more MCPS curriculum-based lessons each year. Our schools are lucky enough to benefit from the support of the Sligo Creek Educational Foundation, the PTA and PTSA, our corporate and foundation donors, and our generous parents and students to keep this invaluable resource in shape for learning. We have raised sufficient funds for the last two years to give a grant to a part-time Outdoor Classroom Coordinator, who assists teachers and staff in developing lesson plans and activities for students in the Outdoor Classroom. Little of our progress would be possible without these critical resources from Outdoor Classroom supporters. Thank you! How can you help the Outdoor Classroom? How can you get involved? The Outdoor Classroom is a precious resource that allows our students to experience scientific, social and other academic concepts in a real-world, hands-on way. As a living resource, it requires constant maintenance and attention. We are extremely fortunate to have a part-time Outdoor Classroom Coordinator who works with students and teachers to develop and teach lessons. We rely on parent volunteers to do maintenance of the space during fall and spring workdays and smaller mini-workdays throughout the year. implementing any new ideas you might have! If you would like to get involved, please contact the OC Committee’s Volunteer Coordinator, Monica Nermark. Our spring workday is scheduled for Saturday March 30, 10am-1pm (rain date April 13). Please join us in preparing beds, weeding and sprucing up our infrastructure. SSL hours available. Park in the lot off Schuyler Rd and enter near the SCES cafeteria. For questions, contact Susan at [email protected]. The K-3 edible gardening season kicks off next week with 3rd grade pea planting! In the coming weeks, 2nd grade will plant carrots, 1st will plant greens, and K will plant radishes. 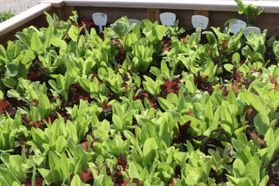 If you’re interested in volunteering to help students plant or harvest vegetables (no experience necessary), email Debbie at [email protected]. The results of Ms. Scott’s classes’ soil organism surveys are in! Kudos to the budding field biologists who found centipedes, bess beetles and worms today and graphed their results by habitat. We discovered that last year’s garden beds are home to tiny worms, while centipedes prefer the habitat under the stumps. Permission slips are available for 4th and 5th grade garden clubs, which begin the week of April 8. If you need a copy, contact Susan at [email protected].